Harmonix and NCSoft have announced they are teaming upfor a brand new game on PC and console. What this game might be is currently unclear, but knowing Harmonix this will likely be a music-based affair. What will be interesting is what NCSoft brings to the table. The firm is an MMO specialist, best known for the Lineage and Blade & Soul games, so how Harmonix's new title will play into that could be interesting. 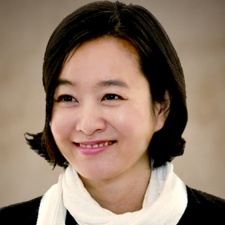 "This partnership is representative of NCSoft's ambition to reach beyond the PC and mobile MMORPG space with new and innovative titles," said NCSoft president Dr. Songyee Yoon (pictured). "Harmonix's decades of expertise at the intersection of music licensing and video game development are second to none, and we can't wait to introduce their upcoming project to the world." Harmonix boss Steve Janiak added: "We're thrilled to team up with NCSoft as a publisher that shares our vision for the evolution of entertainment, and what it takes to build a community on modern gaming platforms. NCSoft's stellar reputation as a partner, combined with its incredible publishing expertise, means that we can focus fully on developing our next genre-defining music experience. I am fully confident they will help deliver what I genuinely believe will be a one-of-a-kind game."